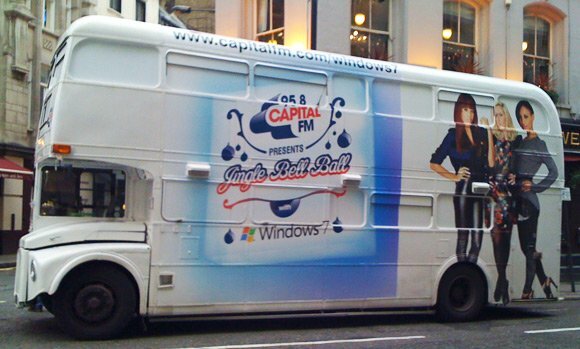 Having decided that Family Guy wasn't exactly the right way to punt Windows 7, Microsoft has decided to get down wiv da kidz by sponsoring the The Jingle Bell Ball - a musical extravaganza this weekend featuring luminaries such as Lady Gaga, Janet Jackson, Miley Cyrus and the Backstreet Boys. To sweeten the Windows 7 experience, MS has brought on board gig participants Sugababes, who previously agreed - presumably in return for a large financial consideration - to showcase the OS's wonders, and are now wowing to the camera about the benefits of giving your cash to the Beast of Redmond. Video highlights include "Faster wake up and search", demonstrating just how the awesome power of Windows 7 can bail you out of everyday emergencies such as the chilling "back of a stretch limo en route to the airport and in urgent need of your flight details" scenario.